Want to know the major town centres in Fiji? This town & city Fiji list of the important town centres will give you an idea on where to explore. 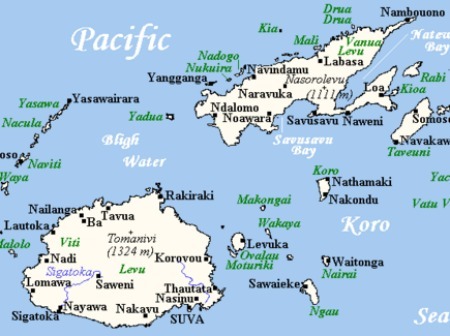 The bulk of the Fiji population is on the two big islands of Viti Levu and Vanua Levu, and therefore, is where most of the significant town centres are located. The capital of Fiji, Suva has a population of 85,691. It's not only the heart of Fiji but the largest city in the South Pacific and is an important regional centre. Read up in our Suva section with information on weather, transportation, history, things to do, hotels, and an interactive google map. Lautoka, with a population of 52,900, is the 2nd largest and other 'city' of Fiji. It's located 24km north of Nadi, and is known as the 'Sugar City' as it lies in the heart of Fiji's sugar cane region. Read up in our Lautoka section. Nadi (pronounced Nan-di), with a population of 42,284, is Fiji's 3rd largest town centre and is situated on the west coast of Viti Levu. This is your transit point for Fiji. In our Nadi section, you will discover Nadi International Airport, accommodation, transport, what to do, weather, and an interactive google map. Nausori is home to Fiji's 'other' international airport. It has a population of 25,000 and lies 19km out of Suva forming one end of the bulging Nausori-Suva populous corridor. Read up on this sugar-turn-rice town in our Nausori section. Sigatoka (pronounced Sing-a-toe-ka) has a population of 9,500 and is situated on the Coral Coast on the south-west coast of Viti Levu. This charming riverside town is the commercial centre for the region and also has one of Fiji's natural wonders, Sigatoka Sand Dunes. On the northern-most tip of Viti Levu, you will find the beautiful region of Rakiraki. It's an especially pretty scene if you are coming along Kings Road from Korovou down the mountains (anti-clockwise around Viti Levu). Labasa (pronounced Lam-basa), with a population of 28,000, is Fiji's 4th biggest town centre and the biggest outside the main island of Viti Levu. Explore this hot and dusty agricultural town in our Labasa section. Savusavu has a population of 5,000 and is the town to visit on Vanua Levu. Situated in a picturesque bay, it's popular with tourists and expats. Read up on the town known as 'the hidden treasure of Fiji' in our Savusavu section. Levuka is the old capital and where colonial Fiji first started. It appeals to it's trickle of visitors with it's old colonial buildings and timber shop fronts.